In the school district where I work, the school year will be over next week, so it seemed appropriate to put together a teacher thank you card, even though I'm a twelve month employee and don't really get a summer break! This one is based on the current sketch at Freshly Made Sketches. 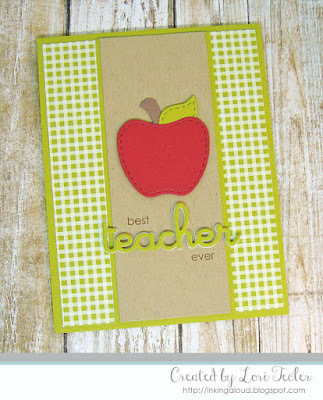 I made a die cut apple, created with the Apple Shaker dies from Lil' Inker Designs, the focal image on my card. The apple was adhered to a kraft cardstock strip using foam tape for dimension. For the sentiment, I die cut the word "teacher" from craft foam and green cardstock. After layering the two pieces for dimension, I adhered them beneath the apple. The words "best" and "ever" from LID's Teacher Talk set were stamped above and below the die cut word in brown ink. After edging the kraft panel with green cardstock, I adhered it to a green gingham panel that had been positioned on a coordinating solid green card base. Great card Lori! I love the colors. A red apple and green gingham is a match made in heaven! Gorgeous card! Thanks so much for joining us at Freshly Made Sketches.